Many of us have always wanted to visit this hidden jem at Tropicana Field, but are stymied by the price point of such an experience. Being able to view a game in this section of the park is an honor and it certainly provides a different feel to the game altogether. What follows is my experience during the Tampa Bay Rays Homestand against the Red Sox on 7/13. I was lucky enough to win a pair of Hancock Bank Club tickets from MOR TV by coincidentally entering a contest through their site. Most of these contests are featured on our Rays Contest Page and are easy to fill out. 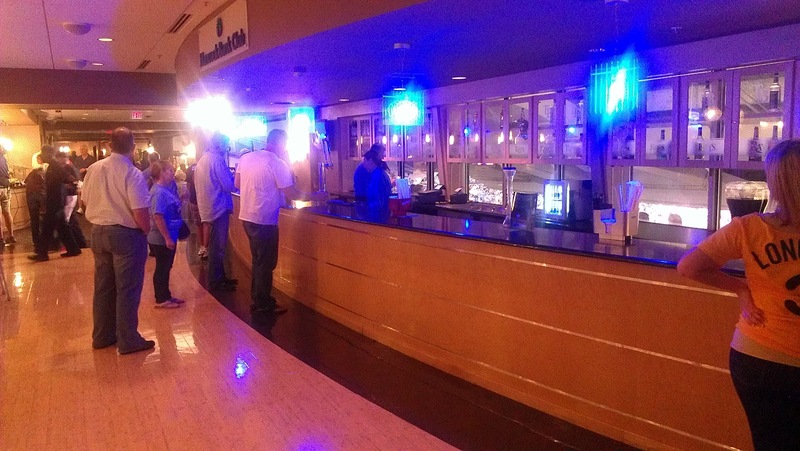 The experience begins by entering through the elevators that lead to the Club level. Normally I am always greeted by the ushers at the Trop and made to feel like I am at home, but this area takes it to another level. As you exit the elevator you enter through two glass doors and are greeted by a concierge greeting you in. What you see next is a plethora of leather couches and seats with numerous bars and buffet tables.. 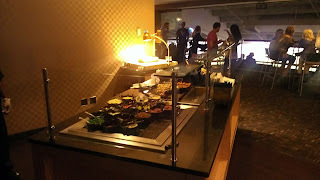 The Hancock Bank Club provides all you can eat and drink. The drinks consist of domestic beers on tap like Coors and Bud products, which are served two at a time to each guest. Wine is also included, but any mixed drink is extra. Prices on those start at $11. They also provide you with Pepsi products in the all you can drink. The bar itself is beautiful but suffers from what is my major problem with the club. The view from the club through the windows is obstructed by the second level of the stands. 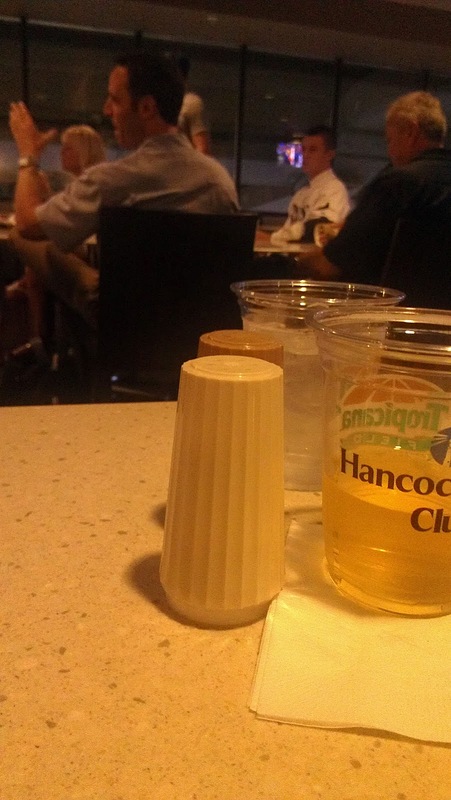 So when you look outside from the tables, bar or couches you really cannot see the game at all. There are plenty of TV’s in the area piping the game through the speakers with Staats and Anderson’s voices filling the Club, but it would be nice to step away from your seats to order a drink from the bar and see the game live. The food selection was fantastic. They provide you with many options for all types of appetites. The create a hot dog station was my favorite, as nothing is better than some spicy chili on a Kayem Dog. What was real special about the food selection was the themed food for the town we are playing. They had some Clam Chowder and Lobster for selection, which my wife really enjoyed. If they do this for each town’s specialty, I would certainly entertain the idea for the likes of Texas or Atlanta’s BBQ. You conclude your meal with an all you can eat ice cream bar, with topping so numerous you can make about 100 different combinations. So the food and drinks were amazing and well worth it, but the view to this point is lacking. Let’s get to your seats. The seats for the game are directly in front of the club providing a great view of the game. The seats are leather and are spacious enough to stretch out. A waiter will come to each row and ask for your drink orders and bring them right to you. Although I will say this game was a busy one, we got the waiter about every 3 innings, which can be tedious. Once back in the club, one of the benefits is the guests you may bump into. This game featured two events that day which added to the excitement of the game. First was the band Train was performing after the game. Second, was that the Rays signed their #1 draft pick, Richie Shaffer, that day as well. The Hancock Bank Club is a happening place where these above mentioned talents pass through and hang out during the game. In fact I was able to sneak a stealthy photo of Mr. Shaffer as I did not want to bother his family during this great day. Overall, I would give this experience a 8 out of 10. I would give it a perfect score if not for the view from the club. I would recommend seeing the game from the seats, but definitely hang in the club for a little while to see and eat your way to an amazing experience. Want to meet your favorite Tampa Bay Rays player but don't want to get to Tropicana Field an hour and a half before a game? Lucky for you, many of the Rays players have appearances and autograph sessions at locations throughout the Tampa Bay area. These locations are typically at businesses that sponsor the team. Check back often for updates. *Free appearances are subject to cancellation or time change. Limit one autographed item per person.